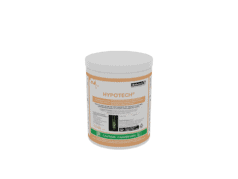 HYPOTECH ® contains the predatory mite Hypoaspis miles used for the management of Thrips, fungus gnats, Leaf miner, Sciarid flies and shore flies. The adults of Hypoaspis miles are about 1mm in size and normally brown. The larvae and first nymphal stages are white in colour. The Hypoaspis are normally dispersed on to a growth media before or after planting or later on in the early growth period of the crop. Mixing of the Hypoaspis into the growth media is not recommended. Best results are realised when HYPOTECH ® is applied before the target pest is well established. Adults and nymphs feed on Thrips pupae, and larvae of Sciarid flies and other soil living insects. The mites can be observed in and on the soil/media feeding within the upper 2 cm and at the base of the plant stems. Seldom would you find Hypoaspis occurring on the plants. A slow but steady reduction of the infestation level will be noticed. Predator prefers humid and moist soil/media conditions but it must not be too wet, they prefer rich organic matter with an open structure and temperature ranges of between 15-30° c.
It is recommended to apply 50-300 mites per m2 or 500,000-3,000,000 mites per hectare. Higher rates are recommended where the target pest has established.